APB Studio Realtime Worlds is not doing so hot after poor reception to the big-budget game. Rumors swirled last week that Realtime Worlds had to cut staff and was in financial trouble. Though some of the staff cuts were explained as that which many studios face after releasing a major product, this may not be the case after all as Develop has confirmed that the Scottish studio has entered administration, a UK concept not unlike bankruptcy. Realtime Worlds' administrator, rescue firm Begbies Traynor Group, is now trying to save it from liquidation by finding an investor. The reveal of Project MyWorld, Realtime's social networking experiment, may have been an attempt to find a publisher to keep the studio in business, but it met with no luck. Realtime's troubles came about due to the poor reception of APB, a five-year project with a budget rumored to be $80 to $100 million. 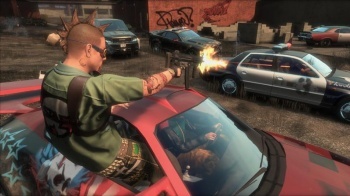 One of Develop's sources said that 170 employees have been laid off, with 50 staying on to support those actually playing APB, but this is unconfirmed. 60 members of Project MyWorld's staff were definitely let go. For now the studio's future is up in the air, with Begbies Traynor trying to save both the Scottish and U.S. offices. But without a project that will attract investors, and what some would consider a massive failure in APB, it's not looking good for Realtime Worlds.